Pause . . . breathe . . . smile. Three small words, yet each contains a universe of wisdom. Let the title be your guide in this inspiring book on awakening to the full depths of mindful living. 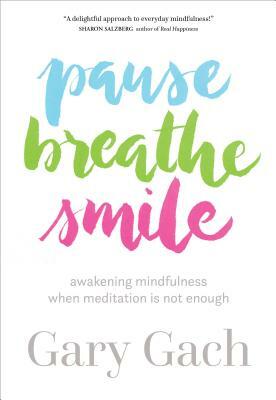 The Pause is about setting our intention before we think, speak, or act--the ethical dimension of mindfulness. When we Breathe, we unite mind, body, and spirit, making every moment an opportunity for meditation. With a Smile, we open to a wisdom beyond words. This simple trio will water your innate seeds of awakening to help you pave your own path to fulfillment and peace. Gary GachGary Gach is a writer, mystic, and lifelong meditator who has engaged in many roles: actor, bookshop clerk, dishwasher, hospital admin, office temp, stevedore, teacher, and typographer. Lay-ordained by Thich Nhat Hanh in 2008, he has authored eight previous books including The Complete Idiot's Guide to Buddhism (Alpha, 2001). Gary lives in San Francisco. For more, visit garygach.com.